Prime Minister Manmohan Singh’s announcement of Rs 1000-crore sops for Jammu and Kashmir on Tuesday before concluding his two-day visit to the Valley had a meaningful message. He, perhaps, believes and rightly so that the state government must give top priority to improving the people’s quality of life. Options are fast running out in Manipur with the two-month-old blockade of the main highway by the Nagas holding the people and the state to ransom. Hospitals are shutting down, schools have stopped functioning, offices are reporting thin attendance and households are worried over the shortage of essential goods, including foodgrains and fuel. THE Bar Council of India’s decision to hold an all-India entrance examination for graduates passing out of law colleges in the country from this December is a step in the right direction. It will help attract merit and talent to the Bar. Unfortunately, legal education in the over 700 law colleges in the country is in a mess at present. JUST as President Obama’s “Air Force One” was readying to land at Afghanistan’s Bagram airbase on March 28, his National Security Adviser Gen James Jones was telling the accompanying Press correspondents that the President would give his Afghan counterpart a dressing down on corruption and incompetent governance. THE United States and India concluded their first strategic dialogue in Washington DC on June 3, 2010 in which cooperation on high technology came up as an important area of discussion among a range of issues including counter-terrorism, disarmament and non-proliferation, United Nations Security Council reform, trade and investment, climate change mitigation, energy and food security, education, agriculture, healthcare and empowerment of women. WITH the introduction of short-term, high-yielding varieties of cereal and oil-seed crops, the cropping intensity has now reached almost 300 per cent in Punjab. Moreover, the intensive use of chemical fertilisers, insecticides and pesticides involve greater use of scarce groundwater resources. HIV infected people find it tough to obtain treatment in common hospitals and the cases of pregnant women patients are more pathetic. When Union Textiles Minister Dayanidhi Maran inaugurated a surgical suite named after his father former Union Minister Murasoli Maran this week, he was appreciated by everyone with social concern for the surgical suite had a separate maternity ward for HIV infected women. Prime Minister Manmohan Singh’s announcement of Rs 1000-crore sops for Jammu and Kashmir on Tuesday before concluding his two-day visit to the Valley had a meaningful message. He, perhaps, believes and rightly so that the state government must give top priority to improving the people’s quality of life. All kinds of elements working against the nation, including terrorists, easily find recruits to implement their dangerous designs owing to inadequate economic activity, causing acute poverty. Large-scale development projects can help reduce widespread unemployment considerably. There is urgent need to raise the per capita income in J and K, which is as low as Rs 17,174 against the national average of Rs 26,000. The state has been doing well in education for some time, yet it lags far behind with the literacy percentage being 55.5 whereas the national average is 65 per cent. These issues, however, are of little significance for those prospering in the border state by playing negative politics. When on Monday the Prime Minister extended the offer of talks to all shades of people’s representatives in J and K, including the militants, provided they shunned the path of violence, there was hardly any mention of development issues in the reaction of separatist leaders and others. During their delegation-level meetings with Dr Manmohan Singh they demanded withdrawal of security forces, repeal of the Armed Forces Special Powers Act, release of political prisoners, zero-tolerance to human rights violations, etc, but talked little about finding solutions to people’s economic hardships. This shows that improving the people’s economic condition does not figure prominently on their agenda. While it is essential to bring to the negotiating table leaders belonging to all shades of public opinion to establish lasting peace in J and K, under no circumstances should development-related issues be ignored. If people need security of their lives and property, they also require enough opportunities to earn their livelihood. Both issues must be taken care of simultaneously. Contentious issues like grant of greater autonomy should be dealt with separately as while politicians are obsessed with them, the ordinary people are concerned about bread and butter issues. Options are fast running out in Manipur with the two-month-old blockade of the main highway by the Nagas holding the people and the state to ransom. Hospitals are shutting down, schools have stopped functioning, offices are reporting thin attendance and households are worried over the shortage of essential goods, including foodgrains and fuel. That neither the Union government nor the state government have managed to break the impasse for such a long time, and they have also failed to check profiteering in the black market, is a shocking commentary on their ability to govern and deliver services. One fails to recall another instance, barring a similar blockade in Manipur earlier, of an entire state suffering such a fate. Firing by the Manipur police last month at one of the border posts between Manipur and Nagaland, resulting in the death of several Nagas, certainly inflamed passions and restricted the use of force to end the blockade, which started on April 11 to protest against the government’s move to hold district council elections. But a crackdown now appears imminent with people’s patience running out fast and following the Imphal Bench of the Guwahati High Court directing the state government to produce the acting president and the president, respectively, of the All-Naga Students’ Association of Manipur ( ANSAM) and the United Naga Council (UNC) . The Nagas in Manipur claim to have received a raw deal from the Meitis. Accusing the Manipur government of neglecting areas inhabited by the Nagas, Kukis and other tribes, several Naga groups had opposed district council elections till amendments were carried out in the Act to their satisfaction. But when the state government decided to ignore them and went ahead with the election, they responded with the blockade, stopping all movement of trucks into the landlocked state. The agitation received a fillip when the state government refused to allow entry to the Naga insurgent leader Thuingaleng Muivah, who wanted to visit his ancestral village. The credibility of the state government as an honest broker took a beating when it went ahead with the elections, thus undermining its own offer to the Nagas for talks. Manipur cannot afford to let the Nagas in the state feel alienated. The state government must address their concerns and also find a way to allow Muivah’s visit to the graves of his ancestors. Strong-arm tactics alone will only boomerang and unite the Nagas. THE Bar Council of India’s decision to hold an all-India entrance examination for graduates passing out of law colleges in the country from this December is a step in the right direction. It will help attract merit and talent to the Bar. Unfortunately, legal education in the over 700 law colleges in the country is in a mess at present. There is no problem with the new National Law Schools which have come up at important centres. The problem lies with the mushrooming law colleges in the countryside. While these institutions have neither good faculty nor libraries, the students themselves seem to be least bothered about making a mark in the profession. Consequently, when they join the Bar, the quality and standards of the subordinate judiciary are adversely affected. The entrance examination is particularly welcome because it will test functional skills and basic knowledge critical for a new entrant to the legal profession. Opposition to the entrance examination is misplaced because it should not be seen as an attempt by the BCI to deprive students of their right to do legal practice. On the contrary, law graduates should view it as an opportunity to prove their worth before entering the Bar. According to Solicitor-General of India and BCI Chairman Gopal Subramanium, while there are 11 lakh registered advocates at present, over 60,000 law graduates join the legal profession every year. Though this speaks volumes about the increasing demand for advocates, what is of fundamental requirement is to screen the entrants to the Bar and ensure quality proceedings in the courts. Moreover, there is no cause for worry for law students because the entrance examination will be held twice a year and they can take it any number of times until they clear it. It will also be held in nine languages — English, Hindi, Telugu, Tamil, Bengali, Oriya, Kannada, Gujarati and Marathi. Things will become clear once the examination process is set in motion and the BCI can always learn from experience and make improvements to the methodology of question papers in subsequent tests. Law is an evolving subject and any attempt to improve legal education and the quality of the lawyers is welcome because ultimately it will help tone up the functioning of the courts. All reformers, however strict their societal conscience, live in houses just as big as they can pay for. JUST as President Obama’s “Air Force One” was readying to land at Afghanistan’s Bagram airbase on March 28, his National Security Adviser Gen James Jones was telling the accompanying Press correspondents that the President would give his Afghan counterpart a dressing down on corruption and incompetent governance. Correspondents were later told that President Obama had spoken about the need for “building a stronger government and battling corruption” to his Afghan host. Earlier, American Ambassador Gen Karl Eikenberry had referred to President Karzai as being “not an adequate strategic partner” and Chairman, Joint Chiefs of Staff, Mike Mullen, had conveyed a “stern message” to Afghanistan’s Head of State. Worse still, a senior Pentagon official, expressing dissatisfaction at allegations of the President’s brother Ahmed Karzai’s alleged links with the Taliban, had reportedly remarked that once these links were established, “We can put him (Ahmed Karzai) on the target list and capture and kill him”. Shortly after the unsuccessful terrorist attack at New York’s Times Square by Faisal Shahzad, evidence emerged that Shahzad had visited North Waziristan, where the “Haqqani Taliban network” of the Afghan Taliban is located together with Al-Qaeda and the Pakistani Taliban. American anger at the refusal of the Pakistan Army to act against the Haqqani network was soon voiced. US Attorney-General Eric Holder asserted that if Pakistan did not take “appropriate action” against the Taliban elements based on its soil, the US would do so. The fact that the Obama Administration is a house divided, however, soon became clear, with Defence Secretary Robert Gates seeking to justify Pakistan’s terrorist connections by alluding to a “deficit of trust” between the US and Pakistan. Gates also said there was “some justification” for Pakistan’s concerns about past American policies, not only because of what the Americans did during Pakistan’s “past wars with India”, but also the imposition of American sanctions in 1992, after the Soviet withdrawal from Afghanistan. Even before his boss spoke, the loquacious CENTCOM Commander Gen David Patraeus rushed in with an apologia for his Pakistani friends by claiming that while Faisal was inspired by militants in Pakistan, he did not necessarily have contacts with the militants. Both Admiral Mike Mullen and General Patraeus evidently fancy themselves to be “soldier statesmen” a la Gen Dwight Eisenhower. Admiral Mullen has visited Pakistan 15 times and General Patraeus no less frequently. Both evidently have high opinions of their abilities to persuade General Ashfaq Parvez Kayani that he should crack down on the Haqqani network in North Waziristan and the Taliban’s Mullah Omar-led “Quetta Shura”. Every Major and Captain in the US forces in Southern Afghanistan doubtless knows that they cannot prevail in the ongoing military operations unless Taliban strongholds across the Durand Line in North Waziristan and Baluchistan are neutralised. Mullen and Patraeus are evidently averse to acknowledging that hard options have to be considered if their soldiers are not to die at the hands of radicals, armed and trained across the Durand Line. Perhaps the most cogent view of the implications of Faisal Shahzad’s Times Square misadventure was voiced by former CIA Official and Clinton White House Aide Bruce Reidel, who played a key role in crafting an AfPak strategy for the Obama Administration. Reidel noted: “What we are witnessing in Pakistan is a very dangerous phenomenon. The ideology of Al-Qaeda, the ideology of global Islamic jihad that all jihadis should focus on the United States as the ultimate enemy, is gaining ground with groups beyond Al-Qaeda. We saw this in 2008 in Mumbai, when the Lashkar-e-Taiyaba attacked American and Israeli targets. These are the targets of Al-Qaeda and global jihad. This spreading of the idea of global jihad is very dangerous and as it gets deeper and deeper into the extremist groups in Pakistan, it means we can expect more attacks like the one we saw at Times Square. While being unable to give any rational explanation for the comments of General Patraeus, Reidel observed: “We can’t eliminate the terrorist problem in Pakistan without Pakistan’s help. And yet we have failed for decades now to get the Pakistanis to give us help, and we have not found the cure to make this happen”. Knowing this American dilemma, a hard-boiled professional like General Kayani, whom the CIA has monitored as describing Afghan Taliban leader Jalaluddin Haqqani as a “strategic asset,” is hardly likely to end his support for radical Islamic groups in Pakistan and Afghanistan, merely because Admiral Mullen and General Patraeus endeavor to massage his ego! Afghan Taliban leaders will conveniently “disappear” should General Kayani commence military “operations” in North Waziristan at the US behest. The Pentagon’s current Kayani-centric policy of acting as apologists for the Pakistani military establishment virtually amounts to abetment of terrorism against their army in Afghanistan and their population at home. The Americans will hopefully realise this and discard their present policies of “all carrots and no stick,” in dealing with Pakistan’s military establishment. US forces need not cross the Durand Line to take out Taliban strongholds. There surely are “local assets” to achieve this. Virtually no Pashtun recognizes the Durand Line as an international border. President Obama will have to recognise that while his Generals may be militarily competent, they should avoid pretensions of being diplomats, or statesmen, as well. Interestingly, Mr Robert Gates and Dr Manmohan Singh attribute problems arising from Pakistan-sponsored terrorism to a “trust deficit”, thereby glossing over the pernicious role of the Pakistan military. Is this merely due to a subliminal meeting of minds? N. Gerald Barrier, or Jerry, was a historian and a scholar of Sikhism. In 1966 he was awarded a PhD on “Punjab politics and the disturbances of 1907” from Duke University and he spent 37 years at the University of Missouri at Columbia, from where he retired. 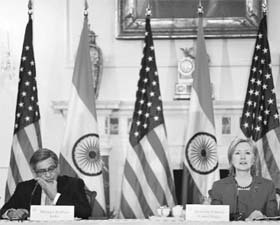 In the joint statement issued after the strategic dialogue by US Secretary of State Hillary Clinton and India’s External Affairs Minister S.M. Krishna “underlined the importance of facilitating co-operation in strategic and high technology sectors” through the High Technology Cooperation Group as a key instrument to achieve the full potential of the strategic partnership. They “confirmed the shared objective of a strong 21st century partnership in high technology”. They also “committed to approach the issue of export controls in the spirit of the strategic partnership between the two countries”. India regards technology transfer as the “acid test” of US commitment and “touchstone” for forging a long and stable US-India strategic relationship. India has been looking for advanced technologies for its defence modernisation and especially for its domestic economic development purposes. However, the US-India cooperation in the area of dual-use technology have over time suffered over different issues including leakage of technology transfer or over the issue of maintaining exclusive control over the area where dual-use technology was to be used. This was because of US export control policies and its support to various international regimes of technology controls, i.e. Nuclear Non-Proliferation Treaty (NPT), Nuclear Suppliers Group (NSG), Missile Technology Control Regime (MTCR) etc. The Strategic Dialogue provided an opportunity to reassess on various problems that bedevilling their relationship. Indian delegation led by Mr S.M. Krishna took up the issue of US export administration regulations on entities which can be linked to nuclear weapons programmes needs. The regulations restrict cooperation with institutions with regard to “dual use” technologies that have military applications. The Indian institutions that remain on the entity list include Bharat Dynamics Limited (one entity), Defence Research and Development Organisation (four entities), Department of Atomic Energy (three entities and all nuclear reactor activity related entities, including power plants) and Indian Space Research Organisation (eight entities). Indian Foreign Secretary Nirupama Rao, in her speech, emphasised that an important element with regard to ongoing US-India partnerships in defence modernisation would be “progress on the easing of US export control restrictions as they apply to India.” She argued that this would not only be a logical outcome of the civil nuclear initiative but also a catalyst for promoting trading and cooperation in high-technology, defence and the space sectors. She added that, “it would also be consonant with the nature of the strategic partnership that exists between us and the growing mutual trust and confidence that is an important driver in our relations today”. In a new National Security Strategy released in May 2010, US President Obama underscored that expanding partnership with India will remain one of his highest priorities. Notably, he has also called India an indispensable partner. Moreover, in a rare gesture, Obama has called the US-India relationship “one of the defining partnership of the 21st century,” to discount the perception that he is not as warm towards India as his predecessor president Bush. The United States feels that this opening to India represents one of the most consequential bilateral engagements in recent history with true global significance, and the US-India strategic dialogue to help create a series of vital conversations between key figures on both sides to help serve as a catalyst for forward momentum in the relationship. The United States’ announcement of its intention to overhaul its export control policy is reassuring. Indian government has shared its views regarding US’ high technology restrictions applicable to India with the US Department of Commerce. India perceives this as yet another area where Indian and US interest converge and, as a reliable and strategic partner, it looks forward to seeing enhancement of trade in such goods and technologies between the two countries and removal of remaining Indian organisations from the Entity List. It is anomalous that a body like ISRO, which is developing several collaborations with US space agency, NASA, should continue to be on this list. It is hoped that the Obama Administration’s response and the outcome of its review would be such that it would reflect and reaffirm the strategic nature of the US-India partnership. Any effort to develop a strong and stable strategic relationship between the United States and India, therefore, must address the technology denial issues. The two countries need to sharpen their focus on export control policies and high technology trade because no worthwhile strategic relationship can be built between the two countries unless the strategic issues involving India’s nuclear and missile programmes are resolved. The water table has gone down alarmingly resulting in huge investment on installation of costly submersible pumps to draw water for irrigation. This does not auger well for sustainable agriculture. Despite the government measures to save water through delaying sowing of paddy crop for the last two seasons, there has been no perceptible improvement in the water table. Nothing is more certain than that continual cropping without the use of manure or compost deprives the soil of its fertility. It is equally certain that fertility may be preserved or restored by giving to the soil animal or vegetable manure equivalent to the matter taken from it. Soils that have little or no addition of organic matter will gradually lose structure necessitating increased chemical fertilisation, cultivation and irrigation. Also without adequate application of organic matter in the shape of animal manure, green-manuring or composting, most nutrients get leached beyond the reach of plant roots eventually reaching the groundwater and pollute it. It is a fact that very few farmers apply animal manure or compost on their farms these days. You just go through a village periphery and you would find lots of garbage/ compost heaps lying alongside the ponds or vacant plots in abundance. A precious input matter is being wasted to pollute the environment instead of using it in restoring the fertility of soils. The big question today is: who will bell the cat? The farmers need to be educated and trained on the huge benefits that would accrue by adopting this composting practice. They would also need technical guidance on suitable structures to prepare proper composting under existing conditions. A number of departments like agriculture, animal husbandry and rural development can play a significant role towards this end. There is a school of thought that considers these organisations as a white ant and indifferent towards the farming community and its problems. Therefore, the onus falls on a solitary body called village panchayat since they are the true representatives of the farmers. They can mobilise all the necessary resources required for their specific conditions and work with its community participation to achieve the desired results. This would not only save our soils from further depletion but would go a long way towards improving the deteriorating environment. During harvesting of paddy crop, Punjab’s atmosphere is awfully engulfed in smoke emanating from the burning of paddy stock in the fields. Mere enactment of laws by the government to ban this practice is not going to help unless some alternative methods to economically incorporate this valuable organic matter in the soil are put in place. Burning of paddy stubs in the field also kills the useful micro-organism, which helps build the soul structure. It is a crime against society since it causes serious respiratory problems. Poor visibility on the roads leads to a lot of fatal accidents during this period. Absence of adequate amount of humus in soil results in non-availability of all the chemical fertilisers that is applied to the plants as some of the fertiliser leach into the ground water causing pollution. It is estimated that with proper composting and green manuring practices, the farmers can save at least a quarter of their expenses on chemical fertilisers, irrigation and cultivation. At present Punjab uses one quarter of total national chemical insecticides and pesticides. This is causing a lot of environmental and health problems for all living organisms. Agricultural production has reached its plateau in Punjab. Some agriculturists are talking about diversification in agriculture without a complementary supporting marketing system in place. Thus, in Punjab’s long-term interest, a high level committee comprising eminent agronomist, soil scientists, microbiologists, hydrologists, geologists, veterinarians, Agriculture Secretary and a cross-section of progressive farmers be constituted to deliberate on these problems and make suitable recommendations to the government. The state of soils, ground water, environment and agriculture in Punjab is already alarming. If immediate corrective measures were not taken, it would be too late to save Punjab’s agriculture and economy. Doctors said the surgical suite would support the Obstetrician and Gynaecology clinic and would be used to fight future cases of paediatric HIV in South India. PPTCT (prevention of parent to child transmission) and general surgical services too would be available. Mr Maran cited an incident in Hyderabad where a pregnant woman with HIV delivered her child on the roadside because she was refused treatment at a hospital, and said a surgical suite like this would prevent such incidents in the future. This would ensure that women with HIV get delivery care at the right time without discrimination, he said. The Sun Foundation, owned by Dayanidhi Maran’s family, donated Rs 12 lakh for setting up the suite, which involved creating a surgery room, four postoperative rooms, sterile storage area and recovery rooms. Bollywood star Hrithik Roshan’s Kites became the first film to be hit by Tamil film industry’s decision to ban films of stars and technicians who attended the International Indian Film Academy festival at Colombo. Even though the ban comes into force only on June 11, theatre owners in Tamil Nadu cancelled screening Kites last Friday itself. All the five theatres in Chennai implemented the ban with immediate effect and others in the state followed suit. The fate of other Hindi films to be released later this month also hangs in balance since the South Indian Film Chamber of Commerce said the ban would be strictly implemented from June 11. Aren’t your cotton clothes keeping you cool this summer? Now, shirts and sarees made from bamboo fibres are available to keep you cool during the scorching summer season. Weavers in a suburb near Chennai have come out with bamboo garments under the guidance of Ahmedabad-based National Innovation Foundation (NIF), an autonomous organisation under the department of science and technology. The first batch of such shirts and sarees were displayed at the inter-state horticulture exhibition at Chennai this week. The garments have the ability to keep the body cool since they do not absorb heat. They are available in several sizes and are affordable.